Read our book to find out more about the essential role of science and technology for international development practice, whether used a force for global economic development or to guide the most basic of daily activities of local communities. Our book Science and Innovation for Development charts the trajectory of moving from a traditional relief-based model of development assistance, which no longer works except in emergency situations, to an approach supporting sustainable economic progress and development. 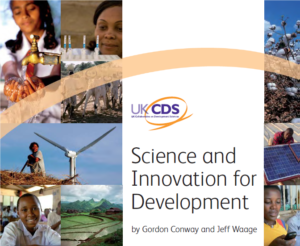 Written by Professor Gordon Conway and Professor Jeff Waage and published in 2010, it calls for greater investment in science and innovation as crucial for the future of development cooperation. With clear, practical and inspirational examples to illustrate the importance of science and innovation in global development, it remains an essential resource for anyone looking to understand how science can contribute to international development, whether new to the field or coming with decades of experience.